Firstly as usual, student work and then there’s more on the Laos project. 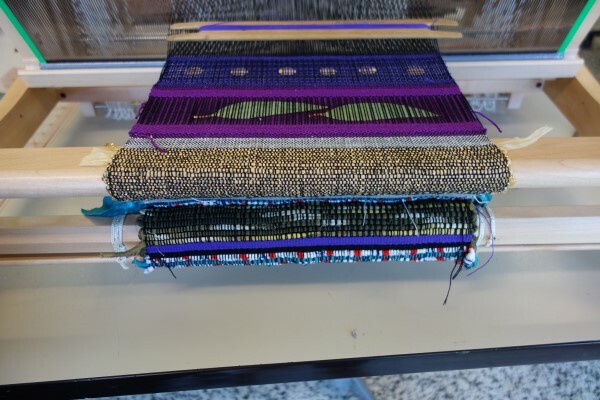 The six students explored weaving with recycled materials. 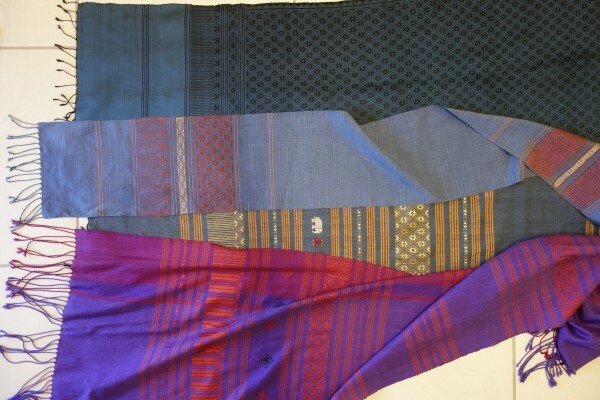 Two were absolute new weavers, two had limited experience and two were more experienced. By the end of the first day, you couldn’t tell the difference in technique between the beginners and more experienced. I was delighted! 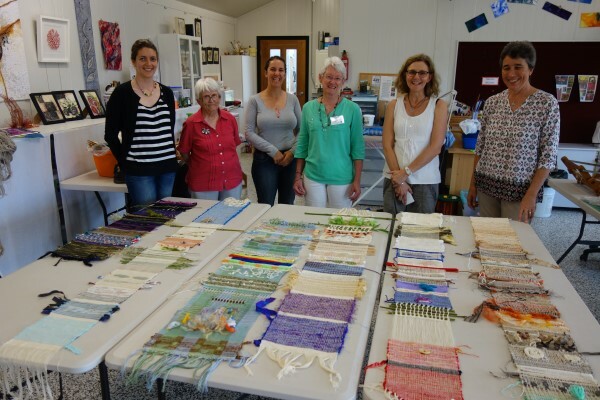 I was also delighted by how enthusiastically they embraced using a wide range of materials, exploring methods of incorporating them into the woven structure. 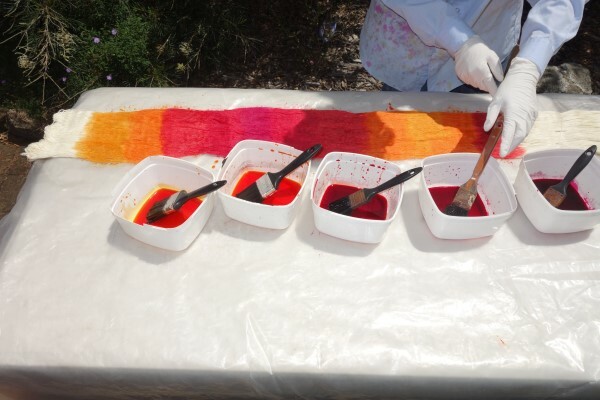 Three sessions explored specific techniques with the last allowing for individual exploration. The following shows the group and what was accomplished. This is followed by an image of individual students’ work. It was a great weekend. In the studio: Fleur finishes her scarf. This project was of her own design, using an aspect of the sampling from her first project. And she begins her third project. 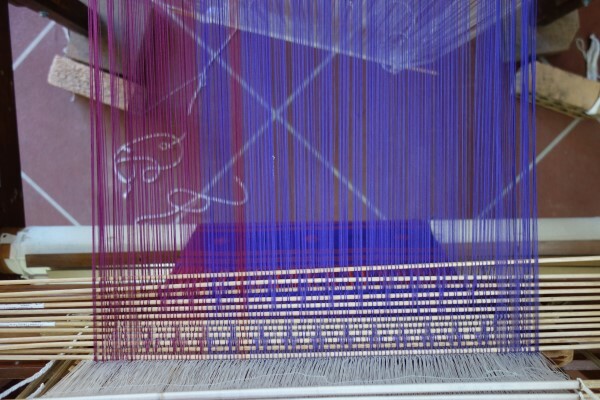 Fleur has acquired some silk to weave a scarf and wanted to do some warp painting. It’s also her first attempt at dyeing. She’s on an exciting journey. 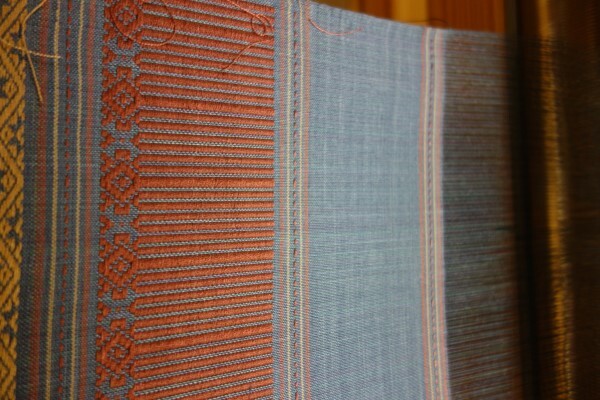 Now for the continuing Laos loom experiment. Last month I got to the point of having the pattern stored. 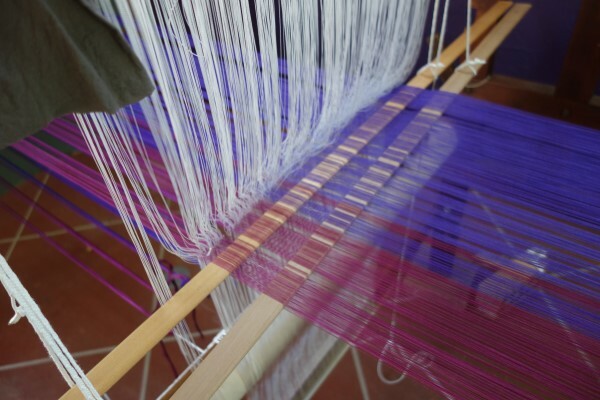 It is a relatively simple matter to transfer the stored design to weave the supplementary weft pattern. The process that I used: Remove the pattern stick from its support. Lower it closer to the warp. Swish it front to back till there’s a cleared gap. I put an extra stick in which is not as flexible to move the heddles at the front well forward, though traditionally this isn’t done. 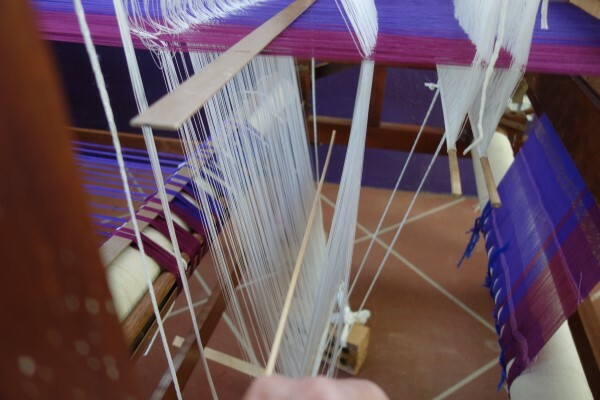 That extra stick is also insurance so that I can move the pattern stick to its next position: either above or below the warp and know that I’ll not have picked up or lost any of the stored design: in this case it is moved to below the warp line. 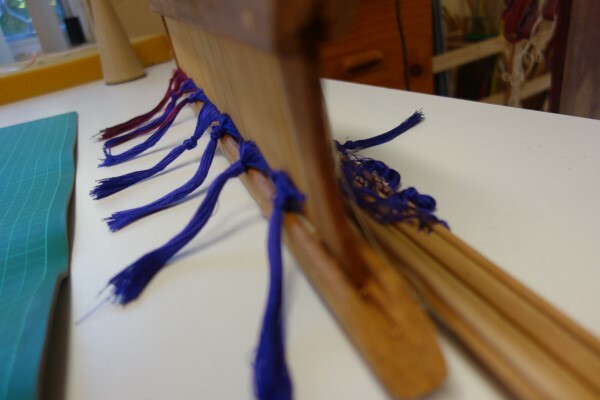 With the pattern heddles moved well towards the front, it is a simple process to raise the selected heddles by pulling on them so that the sword can be inserted. When turned on its side the pattern row is ready to weave. This image shows the sword turned on its side behind the plain weave shafts and beater with the pattern shuttle in the shed. 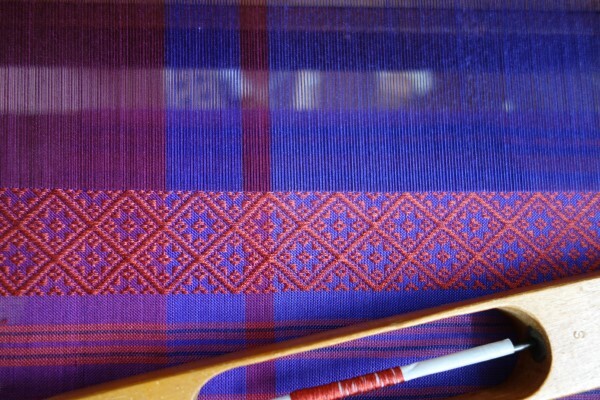 There are two pattern rows woven for each lift with plain weave between. You do not need to take the sword out. If it is pushed back, having the sword in has no effect on compromising the shed for the plain weave. 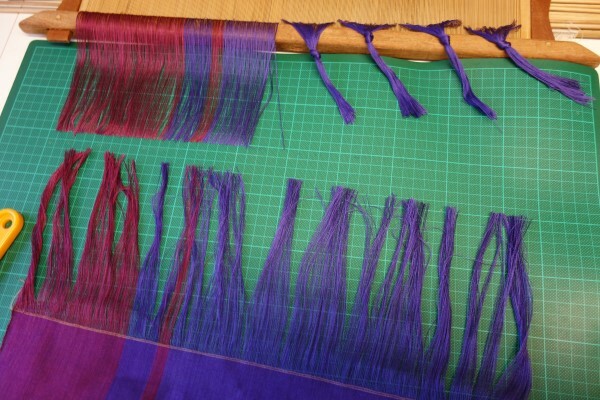 I have used this basic process to also weave the brocade or discontinuous weft pattern. 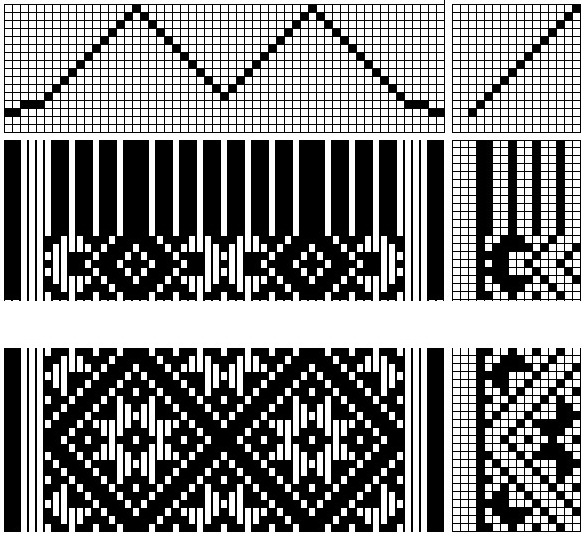 A pattern weft is required for each motif. 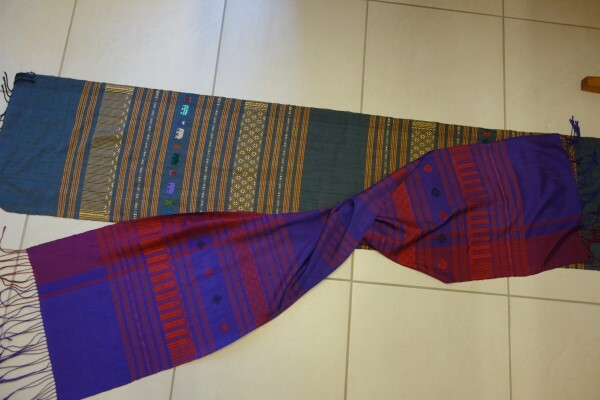 When I saw the ladies in Laos weaving I enquired if they only used one foot. No one used two. Now I know why. It is much easier to control these free hanging treadles if a heel and toe action is used. 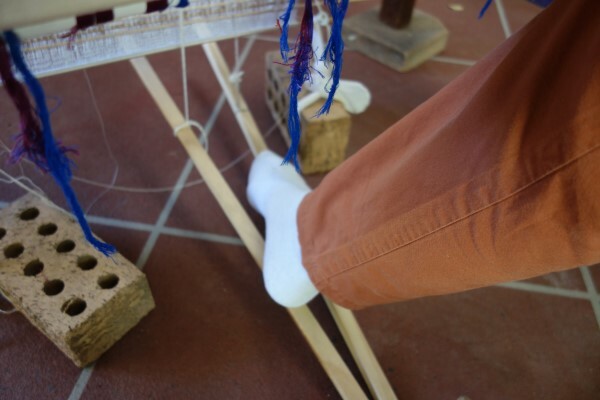 The one foot controls the position of the treadles. They don’t move as much as the foot is always connected to both, all be it in a very minor way when not using one of them. It is all very motion efficient. 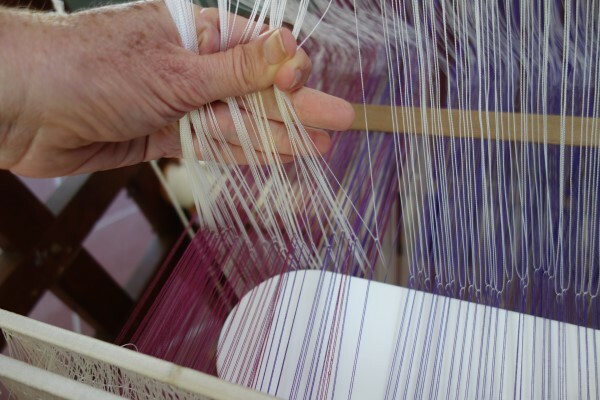 As each pattern area is woven, the pattern sticks are moved above and below the warp line. When they are below, there’s no need for any support. Another pattern area is woven. Now to separate the scarf while making sure I retain the stored pattern. I may want to reuse this at a later date and with the Laos system, this is possible. I want to keep the vertical storage system threaded and able to be reused but without the stored pattern. Firstly, I reinsert the lease sticks as I want to be able to rethread this warp later for plain weave and using a more western set of shafts and further experimentation. These are moved to behind the vertical storage system and can be moved to the front when I’m ready. Then, I transfer the vertically stored pattern to the horizontal. 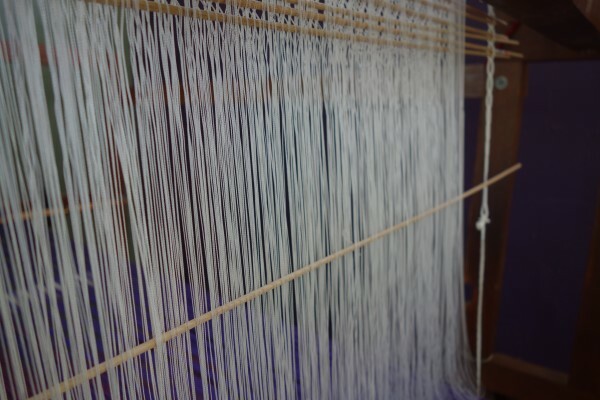 In essence I use a similar method to when I was weaving, however keeping in the sticks in the warp. They are positioned as close to the plain weave shafts as possible. 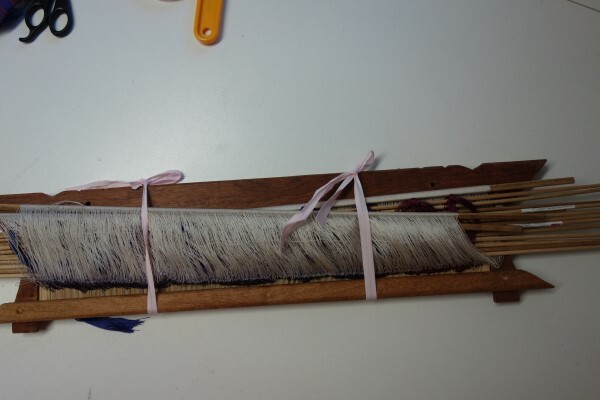 Once all the pattern sticks have been transferred, I carefully cut the warp between the storage system and the series of sticks, knotting on both sides. 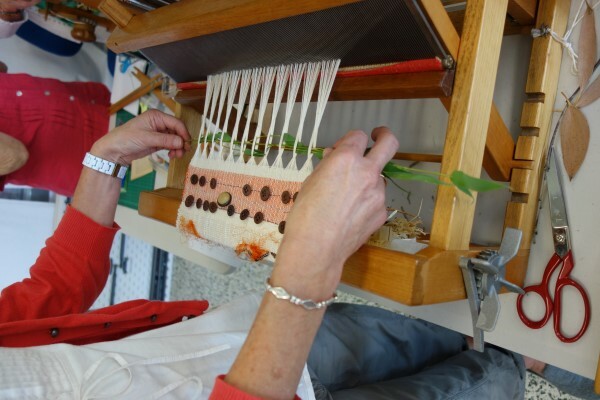 Once the knots have been undone, the entire collection of stored pattern, shafts, reed and woven scarf can be removed from the loom. Now to separate the stored pattern and scarf. 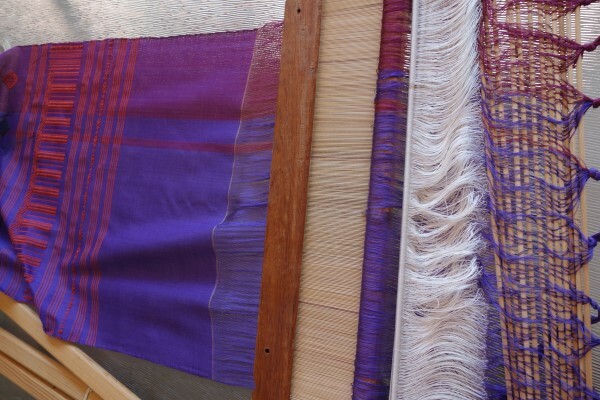 Once the scarf is cut off, the warp in front of the reed is secured. I can now put the stored pattern to one side to be used at a later date if required. This image shows my scarf with the original source of inspiration. 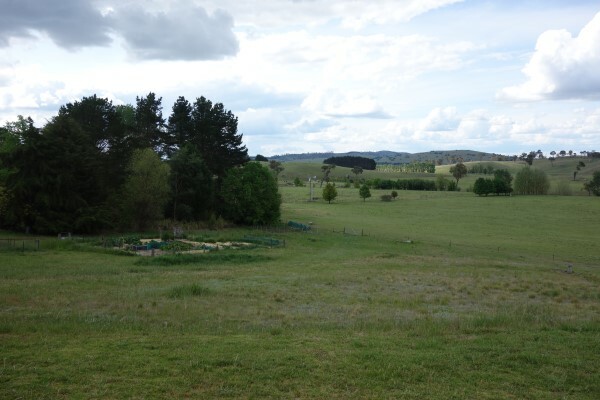 Now that I have completed the project there are some points I want to explore. 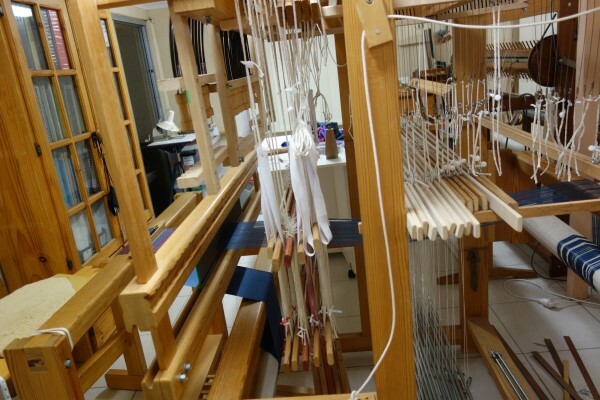 This loom has many similarities to a western drawloom in that both have two sets of heddles. One is to weave the plain weave base fabric, the other to select the supplementary pattern. One of the questions I have is: How do they compare and is there any difference in efficiency? 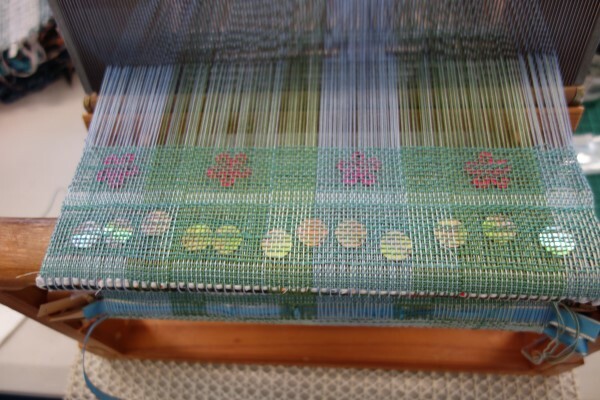 This image shows the two sets of heddles on a drawloom. 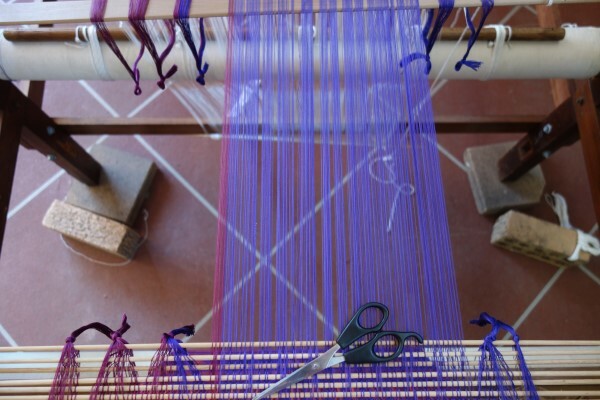 On the left are the shafts which will be used for plain weave. On the left are those for the supplementary weft pattern. 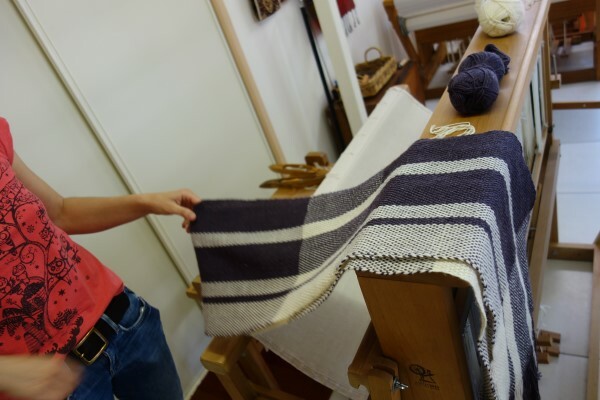 For this project I have used the same warp though it has been threaded at a more open sett (density of the warp threads) to allow for the same warp and weft yarn to be used this time. I have also decided to keep to the original basic design although on a narrower width. The design for the pattern stripes is based on this scarf that uses the basic motif in an all over design and with some different stripe patterns. I have also decided to simplify the border and transition. The original requires about 40 pattern shafts. This simplified version, just 14 . Here’s the draft. For optimal weaving to provide distance between the plain weave and pattern shafts, I have chosen to start threading the pattern shafts on shaft 3. 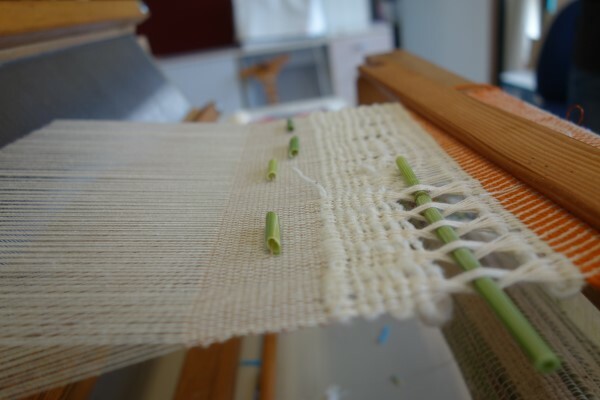 This is the process that I used to weave the pattern: The loom is threaded so that each thread that works in the same way will be on the same shaft. 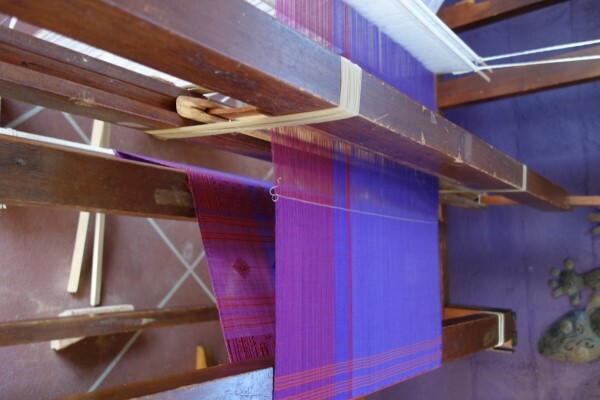 To weave a pattern row the warp threads on each shaft that makes up the pattern are selected. So for the first pattern row (the one at the top), I need to pull shafts 4, 5, 8, 11 and 13. 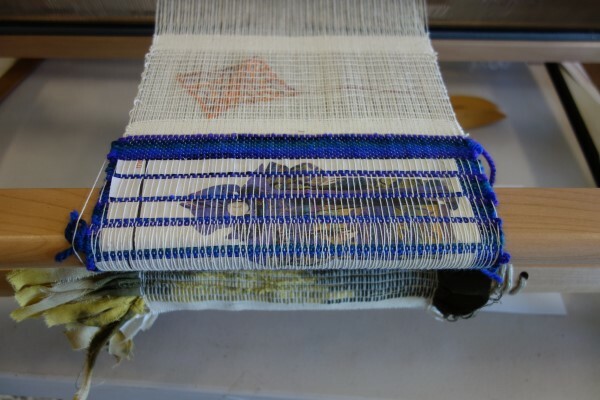 This process needs to be done after every plain weave row. It is very labour intensive with multiple shafts being pulled for each pattern row every time one is required. There’s no stored design option here. The scarf nearly finished. All I have to do is weave 12 cm of plain weave. 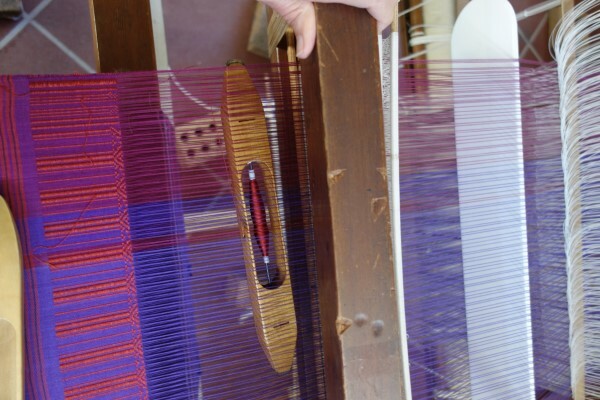 Setting up to weave: On the drawloom, the warp was beamed and then threaded through firstly the pattern shafts and then the front plain weave shafts. 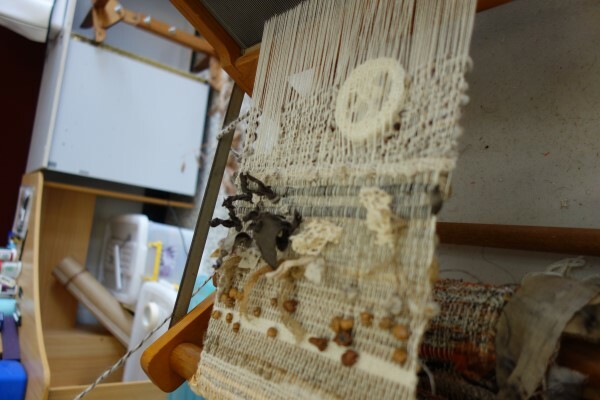 I much preferred the other loom where I just knotted and tied on and then beamed the warp (after of course experimenting with the traditional method of handling a warp). Using the pattern shafts to store the pattern: On the Laos loom, it was extremely slow to pick up and store the pattern on the sticks. 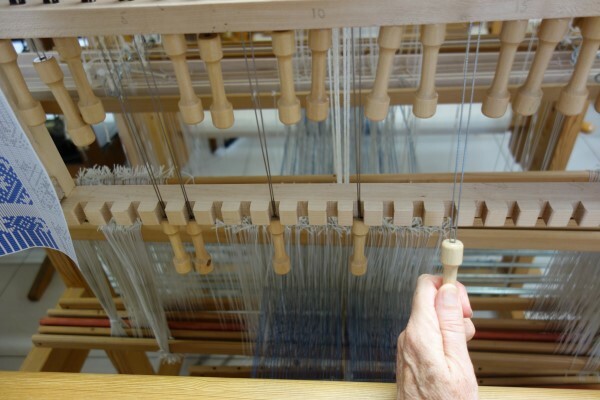 Initially I did wonder about have the equivalent of these sticks on each pattern shaft on the drawloom. That would have meant that I could just pull one cord and the appropriate row be selected. However, the number of long eyed heddles would have been huge as each pattern repeat would have required 105 long short eyed heddles. There are 7 repeats. I just didn’t have them. So instead, I threaded it in a point threading on 12 shafts. Using the pattern shafts to weave the pattern: See the descriptions above. 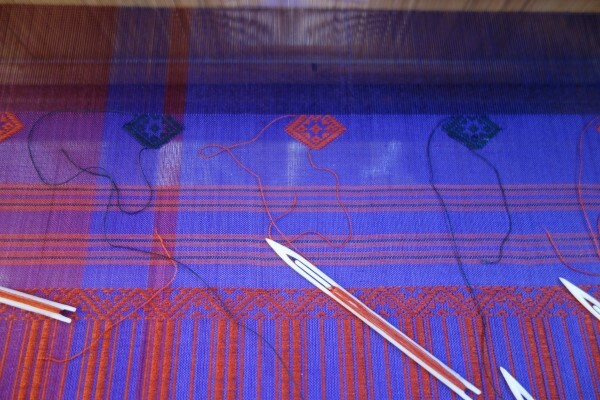 On the drawloom, I had to select several pull cords to achieve the right combination for the pattern whereas there was just one bamboo stick for the Laos pattern row. 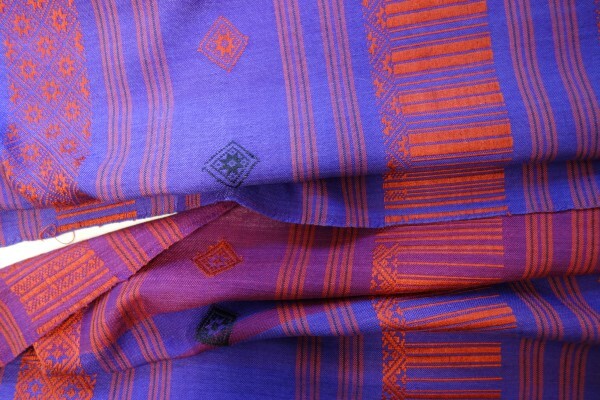 Where the pattern was repeated a number of times, the Laos loom was the most efficient; it just needed the sword to be turned on its side after each plain weave row. The pattern sword stayed in place. The drawloom required a number of cords to be pulled each time. Because the Laos system was new, I got up for each pattern change. The ladies who do this normally just change from the seated position. If I didn’t do this, they would probably take about the same length of time. The pulling of the cords probably allows for a greater incidence of mistake as the Laos pattern is preselected. 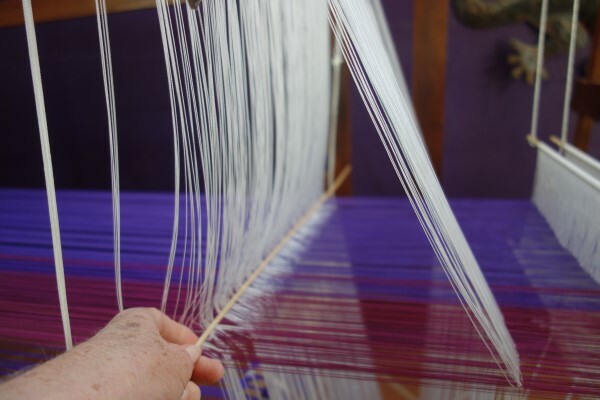 Storing the pattern for another time: On the Laos loom, the pattern, plain weave and reed has been stored and can be reused to duplicate the next project. It would be possible to change the sett by rethreading. I’ll have to set up the drawloom from the beginning for another project. 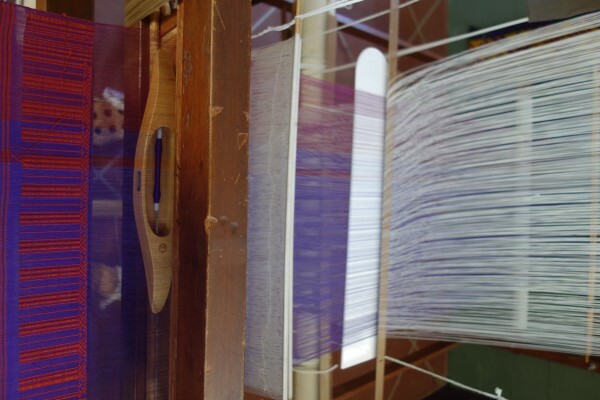 As the drawloom has a number of pattern shafts there is more loom waste than on the Laos loom in its current format with all the pattern ‘shafts’ stored vertically. 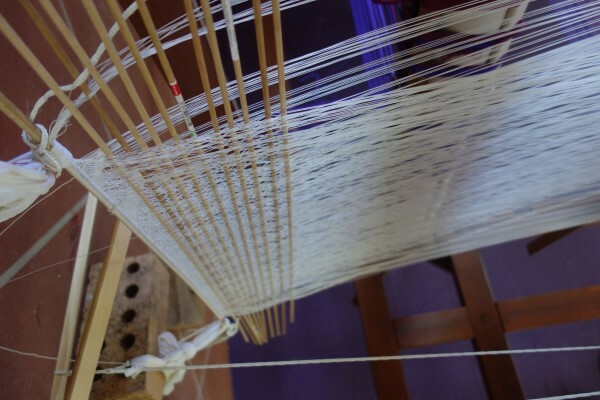 By the way, I’m finding the Laos loom much lighter to weave plain weave than the countermarched action of the drawloom in spite of treadles that are not fixed. Here’s a look at what I have just completed. 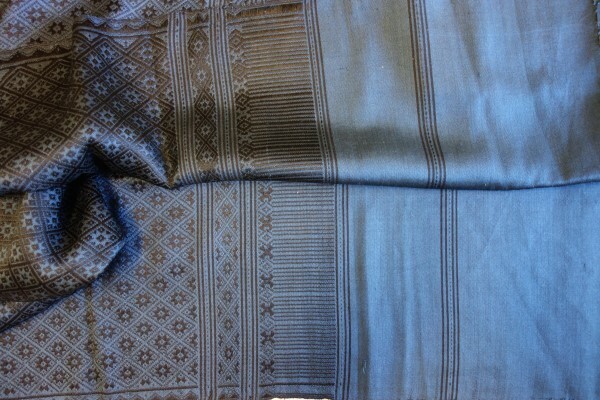 The woven scarf with the original. 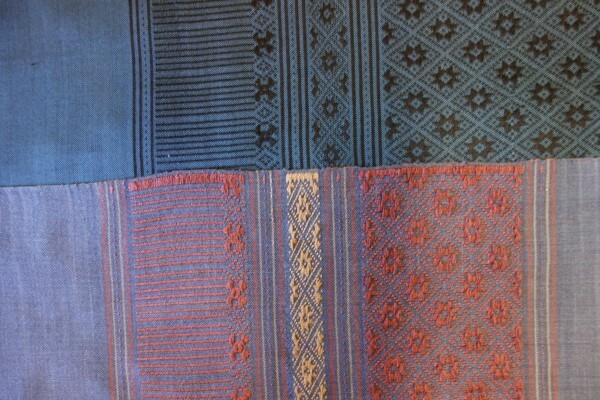 My working collection: two original scarves with two that I’ve woven. There’s an exciting development in the studio. I have decided that I’m enjoying weaving “in the garden” very much but I do not enjoy being exposed to the wind and rain. 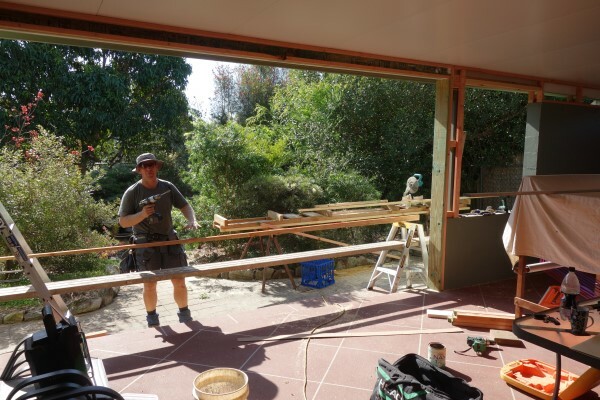 I am now in the process of achieving the best of both worlds with the patio being weatherproofed. You are currently browsing the Kay Faulkner's Blog blog archives for November, 2015.